There are between five and eight million Muslims living in the United States today. They either are, or soon will be, your neighbors and co-workers. Does the thought of reaching out to them with the gospel make you nervous? How can you effectively communicate the good news with such large theological differences? The Gospel for Muslims can help make sharing your faith easier than you think. Thabiti Anyabwile, himself a convert, from Islam to Christianity, instructs you in ways to share the good news of Christ with your neighbors and friends. 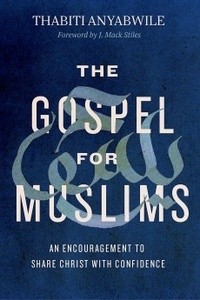 The Gospel for Muslims allows you to focus on the people rather than the religious system. Meant for the average Christian, this book is not an exhaustive apologetic or a detailed comparative study of Christianity and Islam. Rather, it compellingly stirs confidence in the gospel, equipping the reader with the basics necessary to communicate clearly, boldly, and winsomely. Must Read for all Christians encountering Muslims! The message of this book can be summed up in one sentence: Love the Gospel and then you are ready to share it with anyone, even Muslims. This book has been a huge help to us as the world of Islam has come incredibly close to us. What Thabiti shares in this little, easy to read book is practical and heart changing.